The official basketball rules books (196-pages) are filled with tons of complicated words and scenarios you’ll rarely face during local games. This isn’t necessary for a regular coach. Many of the coaches in youth basketball leagues today are parents of the players volunteering their time to coach the team. 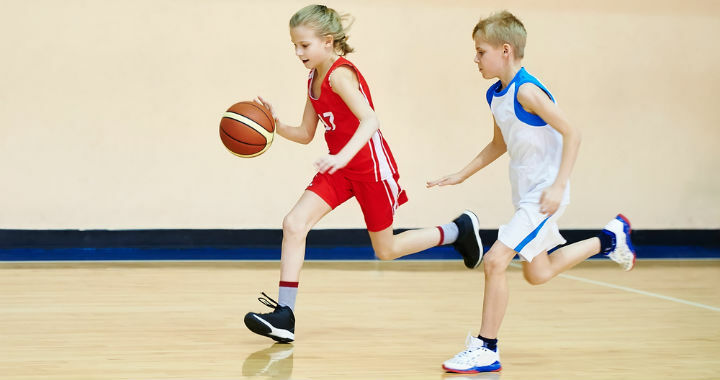 The aim of this blog post is to educate coaches, parents, and players on the main rules of basketball in a quick and easy-to-understand guide. After reading this, coaches should be able to step into a basketball coaching role and have confidence they understand the basics of what their team can and can’t do. Please Note: Rules will vary slightly depending on the league, level, and where in the world the game is being played. I’ll do my best to point out the rules that vary, but make sure to check with your league to be sure. A game of basketball is played with two teams of 5 players on the court. Teams are allowed to have a maximum of 12 players on their roster. Five players on the court and seven players on the bench. The objective of the game is to score in the opponent’s basket and prevent them from scoring in the basket your team is defending. The game starts with a jump ball in the center of the court with two opponents facing the direction of their opponent’s basket. After an opponent score, the opposition must pass the basketball in from behind the baseline. Players can only move the basketball around the court by dribbling or passing. The winner of the game is the team who scores the most points in their opponent’s basket at the end of game time. The court is a rectangle which can vary slightly in dimensions. Generally 94 feet in length and 50 feet in width. The baskets are located on a backboard at each end of the basketball court and are elevated 10 feet above the ground. The free-throw line is 15 feet from the face of the backboard. 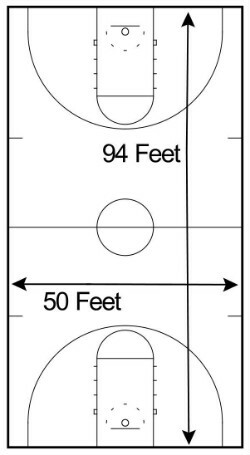 The distance of the three-point line varies depending on the level of basketball being played. High school = 19 feet, 9 inches. NCAA = 20 feet, 9 inches. NBA = 23 feet, 9 inches. The charge circle is a semi-circle surrounding the hoop at a distance of 4 feet. No charges can be taken within this area. Each hoop is a perfect circle 18-inches in diameter. Basketballs come in a variety of sizes to make playing easier for different ages. Youth basketball = Size 5 = 27.5 inch circumference. Women’s basketball = Size 6 = 28.5 inch circumference. Men’s basketball = Size 7 = 29.5 inch circumference. 1. Two Halves – A game consisting of two halves will usually be 15 – 20 minutes in duration for each half. 2. Four Quarters – A game consisting of four quarters will usually be 8 – 12 minutes in duration each quarter. Half-time can last anywhere from 3 minutes – 15 minutes depending on the age group and level the teams are playing at. Shorter time for younger age groups, longer time for professional level teams. The clock will stop on all dead ball situations in the final 1 minute of the first half and final 2 minutes of the second half. The clock will stop for the duration of all timeouts. At the end of regulation, if the scores are tied, there will be an overtime period of 3 – 5 minutes. After this time, if the score is still tied, the teams will compete for another overtime period. This continues until at the conclusion of an overtime a winner has been decided. Each team is allowed one timeout during overtime. The fouls from the 2nd half of the game carry over to the overtime periods. Each free-throw is worth one point. Each field goal (midrange shot, layup, post move, etc) is worth two points. Each shot made from behind the three-point line is worth three points. A substitution is when you swap a player from the bench with a player on the basketball court. This is used to allow players to rest and recover throughout the game as well as give all players on the team a chance to participate. A coach is allowed to make an unlimited amount of substitutions throughout the game. A coach is allowed to substitute their players on and off the court on any dead-ball situation (after fouls, violations, timeouts, free-throws, etc). A substitution is called by asking the scoring table for a ‘sub’ and then waiting for a stoppage in play where the referee will give you time to substitute players. Do not substitute players without waiting for the referee to signal for you to do so or it will result in a technical foul on your team. A timeout is a stoppage in play that allows the coach to talk to the players and allows the players to rest and hydrate. 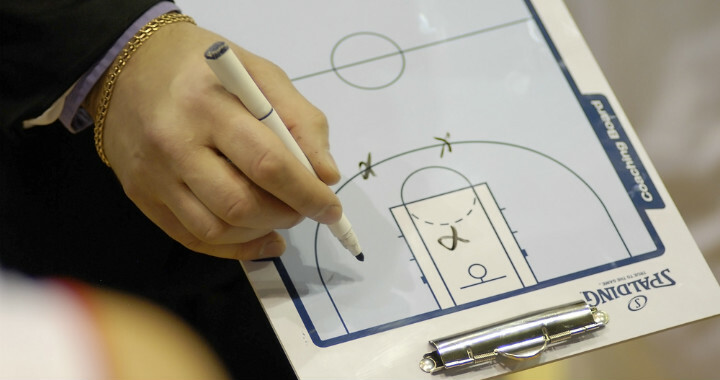 For a list of reasons why a coach should call a timeout click here. Each team is allowed to call two timeouts per half (these cannot be carried over from the first half to the second half). The duration of a single timeout is one minute. During a timeout, the coach can make substitutions. Although regarded as a non-contact sport, everyone who has participated in or watched basketball knows that is not the case. With 10 players on the court competing at a high intensity and attempting to gain an advantage over their opponent, it’s impossible for there to not be contact throughout the game. So – what differentiates legal contact from plays where a foul is called? A foul is called when a player makes illegal contact with an opponent that results in an advantage. When a foul is called, live play immediately stops. Which team receives the basketball will depend on many factors that I’ll cover over the next few paragraphs. Occurs when a defender reaches in to steal the basketball and makes illegal contact with their opponent. The contact made is usually the defender slapping the dribbler’s arm or wrist. A holding foul is called when a player uses their hands or arms to limit or prevent an opponent’s movement around the court. A blocking foul is called when a player uses their body to limit or prevent an opponent’s movement on the court without establishing position. A charging foul is called when a defensive player has established position and an offensive player runs into them. This can happen with or without the basketball. A pushing foul is called when a player extends their arms forcefully to move an opponent on the court. An illegal screen is called when an offensive player who is setting a screen on a defender has not established position when the opposition makes contact with them. If a foul is whistled while an opponent is in the motion of shooting the basketball, the offensive player will receive free-throws. 2 Free-Throws = If a player is fouled while attempting a field goal within the three-point line (layup, post move, midrange shot, etc). 3 Free-Throws = If a player is fouled while attempting a field goal beyond the three-point line. If a shot attempted while being fouled is successful, the points for that shot count and they will be rewarded with only 1 additional free-throw regardless of where on the floor the contact was made. On all non-shooting personal fouls, the team who was fouled receives the basketball at the closest point out-of-bounds from where the foul was made. If a team commits more than the legal number of fouls in a half or quarter, the player who was fouled will receive two free-throws for each additional foul. A player is ‘fouled out’ and must spend the rest of the game on the bench after they have accumulated 5 fouls throughout the duration of a game. After struggling with the definitions for the following special fouls for a long time, I decided to copy the definitions from the NFHS High School Basketball Rules Book. A technical foul is called when a coach or player brings the game of basketball into disrepute and is not made in relation to contact. This could be actions like yelling at a referee, flopping, kicking a basketball, using inappropriate language, holding onto the rim after a dunk, etc. When a player or coach has received two technical fouls, they will be ejected from the game and required to leave the playing area. Penalty: 1 or 2 free-throws (depending on the league) for any opposition player on the court and then possession. A flagrant foul may be a personal or technical foul of a violent or savage nature, or a technical noncontact foul which displays unacceptable conduct. It may or may not be intentional. This could include actions like hitting, kicking, or pushing another player. Penalty: 1 or 2 free-throws (depending on the league) for any opposition player on the court and then possession. An unsporting foul is a noncontact technical foul which consists of unfair, unethical, dishonorable conduct or any behavior not in accordance with the spirit of fair play. An intentional foul is a personal or technical foul that may or may not be premeditated and is not based solely on the severity of the act. When a violation occurs, play is immediately stopped and the team who committed the violation loses possession of the basketball. The basketball is then passed in from outside the court by the opposition at the closest point to where the violation occurred. The basketball is ruled out-of-bounds when it touches either a player, the floor, or an object that is out of bounds. The possession of the basketball goes to the opposing team of the player who was the last to touch the basketball. If the basketball lands on the line, that is still considered out of bounds. Traveling is difficult to describe in writing, but is in place to prevent players from taking more than one step while holding the basketball. This rule also prevents players from moving or changing their pivot foot once it’s been established. 1. A player dribbles the basketball, picks up their dribble, and then dribbles the basketball again. 2. When a player touches the basketball with both hands while dribbling. When two opponents grab the basketball at the same time and it cannot be gained by a single player quickly, a held ball violation will be called. The basketball is given to each team on a rotating basis depending on the possession arrow which will be discussed later on in the article. A goaltending violation is called if an offensive or defensive player makes contact with the basketball while it’s in the downward flight after a shot or if a player touches the basketball when it’s in the vertical cylinder above the hoop. If the offensive player receives a goaltending violation, the basket is called off and their opponent receives possession of the basketball. If the defensive player receives a goaltending violation, the basketball is counted and the defense will then receive the basketball similar to a normally made shot. Once the basketball has been fully established in the offense’s front court, they are not allowed to cross back over the half-court line into the back-court. If they do, the penalty is a turnover. The only exception to this is if a defensive player was to tap the basketball over the half-court line. Then the offense can sprint back and retrieve it. The ‘three seconds in the key’ rule is used to prevent offensive players from standing in the key for long periods of time. Instead, players must continually move around the court keeping the key open for dribble penetration. Once a shot has been attempted, a 3-second violation cannot be called. The offensive team can also be called for a 3-second violation in some leagues. Penalty: A violation is called and the basketball is given to the opposition. Once a player passing in from out of bounds receives the basketball from the referee, they then have 5 seconds to pass the basketball in to one of their teammates. This violation is rarely called, but it’s important to know. An offensive player in the frontcourt with possession of the basketball can be called for a 5-second violation if they’re being guarded within 6 feet and fail to pass, shoot, or dribble within 5 seconds. After gaining possession of the basketball in the backcourt, the offensive team is required to advance the basketball over the half-way line within 8 seconds. The count is continued if the opposition deflects the basketball but stopped if the opposition takes possession of the basketball. In some leagues, the time limit is 10 seconds instead of 8 seconds. A shot clock is used to increase the speed of the game and prevent teams from stalling the basketball. After taking possession of the basketball, the offensive team has a specific amount of seconds to advance down the court and attempt a shot which makes contact with the rim. The length of the shot clock can vary depending on the level of basketball and will usually be somewhere from 35 seconds to 24 seconds. If a shot is taken by the offensive team and the basketball hits the rim, the shot clock is reset to 0 no matter which team takes possession. This rule is used in all professional and college level basketball. Some states have begun to implement the rule in high school, too. A player is rewarded with a free-throw opportunity after being fouled while shooting the basketball, after the opponent has exceeded their foul limit, or after the opponent commits a technical or flagrant/unsportsmanlike foul. This results in one, two, or three uncontested shots from the free-throw line all worth one point each. The player shooting a free-throw is not allowed to jump or step over the free-throw line until the basketball has touched the rim. Doing so will result in a violation and the basketball awarded to the opposition team on the sideline. The four players behind the three-point line are not allowed to cross over the three-point line until the basketball has touched the rim. The five players lined up on the edges of the key can step into the key as soon as the basketball has left the shooters hands. If the defensive team breaks any of these rules, the player shooting free-throws receives one extra shot if their current shot is missed. If the free-throw shooter makes the shot on a defensive lane violation, the shot counts and play continues. If one of the offensive players breaks one of these rules, the free-throw does not count and the opposition receives the basketball out-of-bounds. The possession arrow is used after every held-ball or when the referees are unsure on an out-of-bounds call. The initial direction of the arrow is determined by the jump ball that commences the game. The team who does not secure first possession of the basketball will receive the basketball at the next jump ball. The possession arrow then alternates between the two teams for the remainder of the game. Coaches, parents, and team members on the sideline must wait until the referee has given permission before entering the court to attend to the injured player. If live play is stopped to address an injury from a player on the court, that player cannot stay in the game and must be substituted. They can be brought back into the game at the next opportunity. No shouldering, holding, pushing, tripping, or striking in any way the person of an opponent shall be allowed; the first infringement of this rule by any player shall count as a foul, the second shall disqualify him until the next goal is made. Or, if there was evident intent to injure the person, for the whole of the game. No substitute allowed. If either side makes three consecutive fouls, it shall count a goal for the opponent. When the ball goes out of bounds, it shall be thrown into the field of play by the person first touching it. In the case of a dispute, the umpire shall throw it straight into the field. The thrower-in is allowed five seconds; if he holds it longer, it shall go to the opponent. If any side persists in delaying the game, the umpire shall call a foul on that side. The umpire shall be the judge of the men and shall note the fouls and notify the referee when three consecutive fouls have been made. He shall have the power to disqualify men according to Rule 5. The referee shall be the judge of the ball and shall decide when the ball is in play, in bounds, to which side it belongs, and shall keep the time. He shall decide when a goal has been made, and keep account of the goals with any other duties that are usually performed by a referee. The time shall be two 15-minute halves, with five minutes’ rest between. 1. Take this BFC Basketball Rules Guide as a general overview of the common rules of basketball. If you want to be 100% sure on the rules in the league you’re coaching, get in contact with the people who run your league and clarify the rules you’re not sure about. 2. Referees are human. They’re not going to get every basketball call correct just as you or I wouldn’t if we were in their place. Once a call has been made, no amount of complaining a coach or player does will change it. 3. This basketball rules guide was not created to compete with the comprehensive rule books that are available like the Official FIBA Basketball Rules and NFHS Rules Book. 4. As stated at the start of the article, rules change all the time and vary between different leagues and age groups. While I will try to keep this list updated, I can’t make it specific to all levels and rules will be changed, added, or removed over time.